Widespread biases on economics are far from harmless. Wrong ideas held by voters usually lead to catastrophic policies. In other words, in most cases, politicians undertake those policies that they deem popular among voters in order to get re-elected. If those policies beget pernicious consequences for the economy, harmless beliefs turn into lower living standards for all. The most potentially-harmful bias believed by the average voter is anti-foreign bias. This inclination to underestimate the benefits of economic cooperation with foreigners manifests itself politically in two main ways: protectionism and anti-immigration policies. Despite the recent surge of protectionism in some developed countries, free trade is now the rule rather than the exception in most parts of the world. However, when it comes to immigration, only a few steps have been taken worldwide over the last decades in a direction of liberalisation (even though the consensus about the benefits of more open borders in the economics profession is probably as strong as the consensus around free trade). Anti-immigration policies reduce the well-being of both potential immigrants and host societies as shown by economic theory and empirical evidence. Or to put it differently: even a partial liberalisation of immigration restrictions would, in the long-term, contribute to improve standards of living globally. The economic case against less restrictive immigration policies rests on shaky pillars. The most common anti-immigration arguments are related to the supposedly negative effects that immigration has on the host country’s labour market, and more specifically, its impact on employment and wages. According to advocates of immigration restrictions, immigrants do not only take natives’ jobs but they also have a depressive effect on wages. However, economic theory does not support these assertions. First, the economy is not a zero-sum game: the numbers of jobs available is not finite. As pointed out by Alex Tabarrok (here and here), immigrants are not only producers but also consumers, which implies that an increase in demand triggered by the expansion of the immigrant population goes hand in hand with an increase in total employment. Also, and contrary to conventional wisdom, not only highly-qualified immigrants create positive externalities on host economies. Low-skilled immigrants tend to take lower-productivity jobs (as they often either lack higher education or do not speak the language), allowing the native-born to access higher-productivity jobs (assuming a flexible labour market). All said above can be also applied to wages. All else equal, the law of supply and demand says that an increase in the supply of labour would inevitably cause lower wages. However, more immigrants also mean a higher demand for goods and services, which in turn results in a higher demand for labour, preventing a generalised decrease in salaries. Even in those cases when wages in a particular sector are temporarily pushed down, lower wages lead to lower costs for companies, which usually results in lower prices for consumers due to the process of competition. Immigration-friendly policies can also help tackle the demographic problem that many developed countries have been experiencing over the last years. For instance, the progressive demographic ageing of the American population is already having an impact on the US social security system. According to the Population Reference Bureau, the share of Americans over 65 years old will have increased from 15% in 2014 to 24% of the population by 2060. As a result, the worker-to-beneficiary ratio will decrease by 32%, from 3.4 in 1990 to 2.3 in 2030. This problem could be mitigated by adopting a more flexible immigration policy that increases the working population, reversing the trend that will otherwise end up with significant spending cuts in social security benefits. The discussion so far has focused on the benefits of immigration for receptor countries. How do sending countries and immigrants benefit from the migratory phenomenon? Immigrants usually transfer part of their income to their countries of origin with the aim of economically supporting their families and friends. These so-called remittances are flows of capital from developed to developing countries that assist in the economic development of sending countries. The main beneficiaries of eliminating barriers to labour mobility would be, no doubt, immigrants themselves. This is due to the concept of Place Premium. This concept, first introduced by Michael Clemens, Claudio E. Montenegro, and Lant Pritchettin in a 2008 paper, refers to the automatic increase in earnings (PPP adjusted) that a worker experiences by moving from a low-productivity country to a high-productivity country, without increasing the worker’s human capital. The factors behind this phenomenon are multiple: differences in capital accumulation, quality of infrastructures, technology, proximity to high-productive workers, different legal frameworks, etc. The empirical evidence shows that wage differences among countries due to Place Premium are immense. The corollary is simple: more open borders would bring about a substantial reduction in poverty levels across the world. What would happen if migration barriers were partially or totally eliminated on a global scale? In his paper Economics and immigration: Trillion-dollar bills on the sidewalk, Michael Clemens, senior fellow at the Center for Global Development, reviews the academic literature on the topic. If all barriers to labour mobility were to be removed, world GDP would increase in the range of 50% to 150%. Even partial liberalisations would bring about considerable gains. For instance, a reform that allowed 7% of the population to emigrate to higher-productivity countries would result in an efficiency gain of 10% of world GDP. 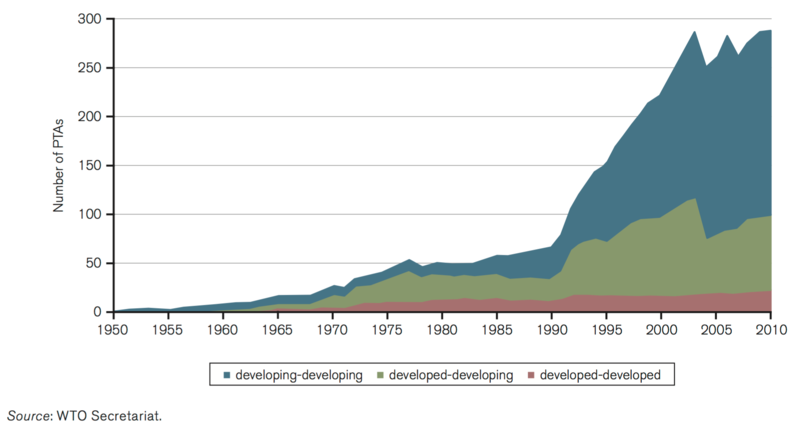 To put this into perspective, if all remaining trade barriers were eliminated, world GDP would grow by just 2 or 3%. As shown, the impact of relaxing migration barriers on the world economy would be extremely positive, especially for the poorest segments of population. This clearly supports the adoption of more immigration-friendly policies as a way of increasing economic growth and improving the welfare of millions and millions of people, including those in receiving countries. This article was first published by Students for Liberty and the IEA’s blog. Recommended further reading: ‘Free to move. The costs and consequences of restrictions on migration‘ by Philippe Legrain.